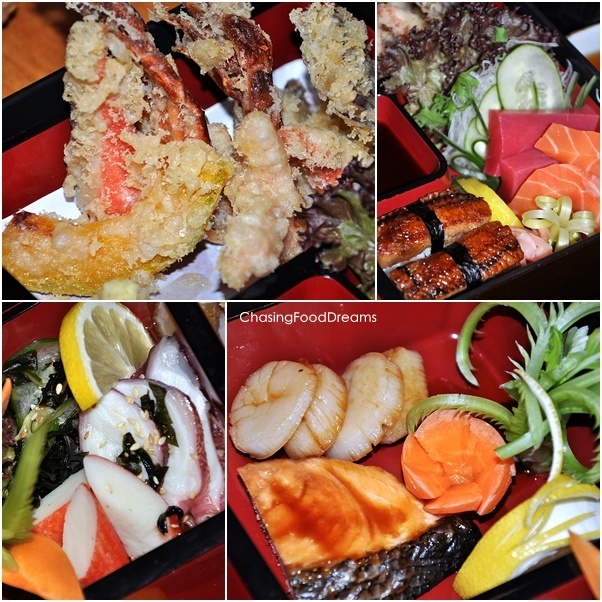 CHASING FOOD DREAMS: Kin No Uma Japanese Restaurant, Palace of the Golden Horse: Oishii! 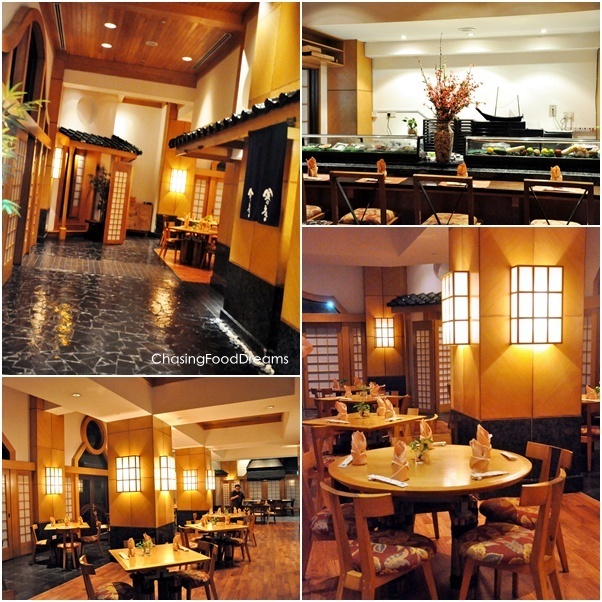 Kin No Uma Japanese Restaurant, Palace of the Golden Horse: Oishii! When one speaks of dining in luxury, one can certainly relate luxury to the grandeur of dining at Palace of the Golden Horse! Kin No Uma Japanese Restaurant is undeniably a favorite spot for Japanese food lovers. Tagged as Asia’s most extraordinary hotel, Palace of the Golden Horse is a world-class award winning luxury hotel located within Mines Resort City. As soon as one step into the grand lobby, one can be mesmerized by the grandeur of the mural of horses to the statues of the horses and pillars surrounding the ambience. This enchanting palatial hotel with over 472 guestrooms and suites is well known with royalties, international dignitaries and infamous guest when planning their stay in the capital city. Exquisite landscaped gardens spanned across the wide green lawn with an immerse 150-acre lake, formed the backdrop for gorgeous fairytale weddings filled with mythical and magical moments! I was certainly mesmerized by this grand statue of horses signifying the power and courage elements in the palace. Another strong element of horse that caught my eye! I also cannot help but to notice the gothic and surreal chandelier designed lightings which are mysteriously beautiful in its own way. I proceeded to the Japanese restaurant, Kin No Uma, along the long corridors till I saw the lovely artistically drawn horse logo for the restaurant. At the entrance, I saw waitress clad in dainty kimonos in various colors and the beautiful wooden entrance. There was even a nice bamboo fountain with soft water flowing gently to harmonize the ambience. The whole restaurant was designed in a golden amber wood finish with soft amber lights to soften the décor. A long sushi bar designed to fill customers with chef’s action for their perusal. There was a few tatami rooms which I felt in awed from its wooden floorings to the table settling and chairs. Entertainment with privacy is definitely a luxury here!! 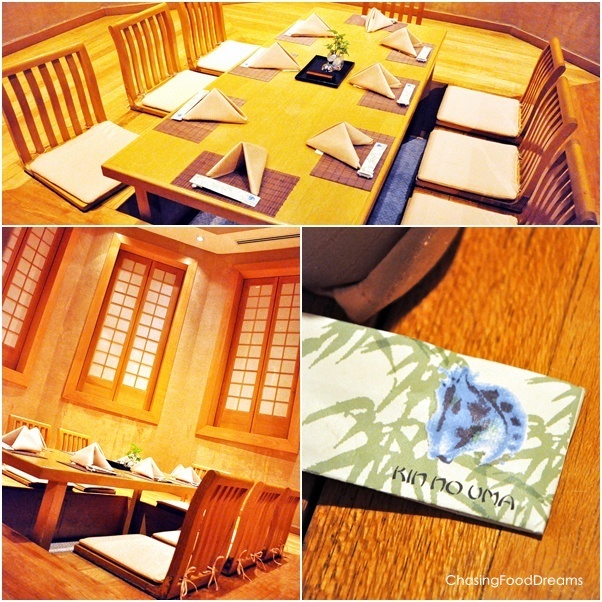 First up, Tuna with Fermented Soya Bean (RM24++) was served in royal blue Japanese earthenware. Presentation in Japanese cuisine are very meticulous, hence I expected no less that this in the dish. The tuna was fresh and when taken with the Natto, it was certainly a very unique dish. Natto, fermented soya bean needs some getting used to it as it has a sticky and gooey texture which I didn’t know how to enjoy. However, the Japanese devours this on a daily basis on believe of its healthy values in the protein beans. Assorted Seafood, Seaweed and Cucumber in Vinegar Sauce (RM34++) was a long favorite of mine. Maybe it was because I like sour flavors! The array of artfully arranged seafood galore with wakame and kyuri with its well balanced of vinegar dressing was a simple yet satisfying appetizer for me. Raw Beef Tataki with Ponzu Dressing (RM28++) was not that raw as it was lightly grilled on the outside. Tender and juicy, the meat still had that raw edge and was sumptuous with the lovely Ponzu sauce made from soya sauce with Yuzu. Grilled King Prawn with Mayonaise Sauce (RM48++) had a wonderful creaminess to the dish. The king prawns was well grilled and the sauce added the luxury to the crustacean. The heads were tempura fried for a crispy finish. Deep Fried Assorted Seafood and Vegetables in Tempura Batter (RM42++) was an array of lightly coated seafood galore. Crunchy without the oil, the dish was wiped out clean by us with its lovely tempura sauce mixed with grated daikon radish. Kin No Uma Roll (RM58++) was the house roll for a special reason… the roll was simply outstanding from its ingredients to its flavors and presentation! Tempura King Prawn, lettuce, cucumber, and avocado wrapped with sushi rice, cheese and seaweed before being coated with pearls of fish roe and drizzled with mayo. The flavors jived so well together and compliment each other very well. Each bite was a popping sensation filled with a luscious finish. We also sampled all their hand rolls from California Handroll to Prawn and Soft Shell Crab filled to the maxed with lots of veggies and crunchy oranged fish roes. Salmon, Tuna and Eel Handrolls were equally satisfying with its freshness and overall flavor combination. Prices run from RM16++ to RM28++) for the hand rolls. Buckwheat or Thick Noodles in Hot Broth with Deep Fried Tempura Fritters (RM27.50++) is quite the popular dish during lunch hours as advised by the management. It may be simple, but the complexity lies in a good broth with well made noodles to bring out the goodness to the dish. Overall flavors were balanced on my tongue and the broth was really comforting. The udon noodles were al dente and still had the bite in it which is a plus point for me. Slurp it up like the Japanese do to enjoy it! Garlic Fried Rice (RM17++) surprised me with its additional accompaniment of super thin and crispy fish skin. Lovely addition and the rice was also loaded with perfectly fried garlic slices which is what every garlic fried rice should be. I had a whole plate of this to myself!! 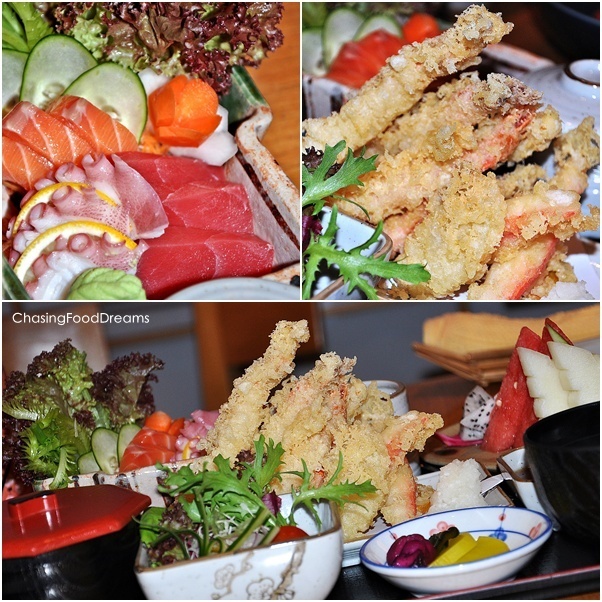 Sashimi To Tempura Lunch Set (RM60++) was an assortment of dishes for those who enjoy a buffet of dishes. Available during lunch, the set meal had two main dishes of Sashimi and Tempura with pickled radish, salad, Chawan Mushi, Miso soup, rice and fruits. The chucks of Sashimi is without a doubt beautiful and coupled with Tempura, this is a lovely match for those who get to enjoy both in a meal. There is four main dishes of tempura, sushi and sashimi, sunomono of seafood, and teppayaki of scallop and salmon. There are also the usual accompaniments of rice, Miso soup, Chawan Mushi, pickled radish and fruits to go with this set. Now that’s what I called a real deal!! 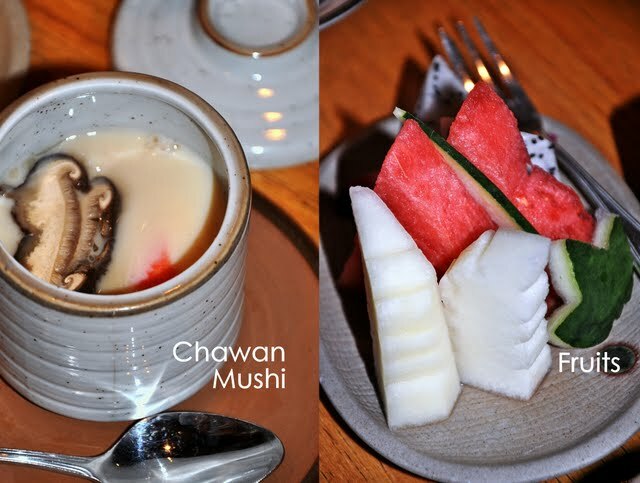 Check out the lovely Chawan Mushi which was smooth and soft. The fruits added a refreshing palate cleanser. For desserts, we had the infamous Green Tea Ice Cream with Red Beans (RM17++). House made by Chef Khair, the ice cream had a strong green tea flavor which I like. I had two scoops that night. The next dessert of Soft Glutinous Rice Dumpling with Mixed Peanuts (RM21.50++) reminded me of the Chinese Mua Chee. The one here was chewy and scrumptious and the aroma of peanuts was heavenly. It also had the perfect balance of sweetness as I do not like an overdosed of sugar in this dish. The lavish spread of Japanese cuisine was simply amazing that night. Everyone commented how opulent the meal was and we certainly deemed that the meal was fit for royalties! Freshness and quality is one of the plus points for this restaurant and the great variety of dishes from sushi to kaiseki and teppanyaki would satisfy any picky eaters. From the moment I stepped into the restaurant, Kin No Uma had me experiencing the warmth and authenticity of the Japanese cuisine. The place maybe steeped in price but you get what you paid for with its fine dining qualities and service. This is definitely a place to entertain in style if you want to impress your guest! * Thanks to the Management of Palace of the Golden Horse and BBO for the gorgeous food review!